I’d been meaning to read Miss Lonelyhearts for awhile because, well…it’s short. Seriously, if you write a book that I can read in two hours, then there’s a good chance that I will read it just because I can. I was also fascinated by the premise. 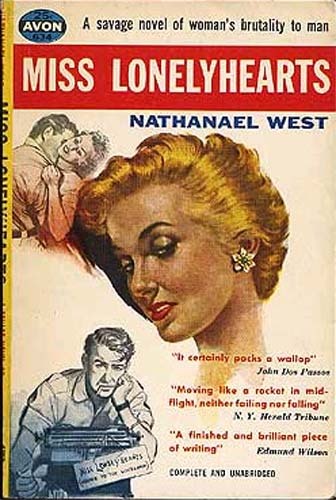 The main character, known only as Miss Lonelyhearts, is a man who writes an advice column for a New York newspaper, and is eventually driven mad by the flood of human misery that pours into his mailbox day after day after day. Although it seems almost wrong to be drawn to a work of classic literature because of a base sympathy with its subject matter, I do admit to being a devotee of advice columns. Back when I was in grade school, I used to read Ann Landers religiously. And nowadays I read both Cary Tennis’ advice column in Salon and Ask Prudence in Slate (although the latter frequently horrifies me with her simplistic worldview and lack of sympathy for her correspondents). However, I’d always held back from the novel because I thought it looked a bit too cynical and nihilistic. Since I myself am somewhat cynical and nihilistic, I feel like I ought to have a place in my heart for books that are the same (like the works of Michel Houellebecq), but I just don’t. I dislike them (well, except for Bret Easton Ellis, I suppose). In my fiction-reading, I seek some semblance of the order and meaning that is not provided by my daily experience of the world. But this time, I delved just a few pages farther into Miss Lonelyhearts and discovered that it’s not really nihilistic at all. Rather, it’s morbid. It’s about a person with too much pity and too much compassion; a person who’s glutted by the pity he feels for his respondents and overwhelmed with the awful power they’ve placed in his hands–they’re trusting him to say a few hundred words that will, somehow, alleviate their pain. Okay, I can roll with that. The story is told in a bizarre screwball comedy style. Chapters aren’t numbered, instead they’re given episode titles like “Miss Lonelyhearts on a field trip” or “Miss Lonelyhearts and the party dress”. Miss Lonelyhearts reads horrible, piteous (and comically exaggerated) messages and attempts to answer them. All the while, he’s tormented by his editor, the Shrike, who pokes fun at the religious belief that both he and Miss Lonelyhearts are secretly convinced is the only true escape from the horror of the world. And then Miss Lonelyhearts gets drunk and gets into barfights and seduces women and toys with his fiancé. He’s not a bad man so much as he is just…lost. Everything is too horrible; he can only manage to get through his life by living it on a day by day basis. It’s an interesting novel. It reads a little like Dostoyevsky (who also gets a shout-out in the text), and can, at times, be equally overwrought. Still, sometimes it is comforting to see a character shriek and moan and pity himself. At times, it’s hard not to assign a moral value to the lushness of a work’s prose. Sometimes it seems like the most spare and unadorned works seem to be the ones where protagonists also act in the most inexplicable fashion; the words that would explain or rationalize their actions are simply absent. When protagonists act morally or heroically (as in Hemingway), this goes unremarked. But when they act in an amoral fashion (as in Bret Ellis or Houellebecq), then the lack of adornment seems almost to countenance evil…as if no explanation was necessary, and people hurting other people was as simple and mechanical as birds flying overhead or the waves lapping at the beach or any other action of the setting.